At first look we thought this was a plotter, but it’s really more of a dot matrix (or line matrix) printer. [Bruno] whipped this up using parts from a DVD optical drive. 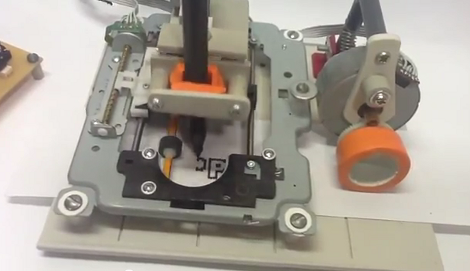 It is capable of moving the pen along the Z and X axes, and feeding the paper along the Y axis. The video after the break shows the machine printing Megaman, an image perfectly suited to the low-resolution pixels this can put out. But even without the high-pixel counts you might get from a thermal printer, we just love the look of this one. And who doesn’t have an optical drive sitting around just waiting to be hacked? It looks like the one part you’re going to have to source is the stepper motor and geared feed wheel that moves the paper. This is sweet as. Great work. Printed circuit boards. Looks easier than inkjetting yellow resist, though there probably would be issues with extra fine details that the inkjets could handle. In this configuration the boards will have to be longer (Y-Axis) than the print area due to the feed system, meaning a lot of wastage. Perhaps a carrier could be made – thin mdf cut with a scalpel and steel rule, recessed to fit whatever size copper clad is used. I like it but how does he input data to the printer? The quality of this thing is impressive, considering what it’s made out of. I wish the stuff I pieced together out of junk looked this good! next tiny RC quadrocopter printer! Very cool! I wondner if it could just draw lines instead of doing a chuckalakalakalaka when there’s a series of consequtive dots. I really like the pen lifting part, clever! the machine could be faster if it didn’t go back all the way to the left/right extremities when there are no pixels to write, unless it needs to do that to realign the head. moving with the pen down might move the paper, it doesn’t look like its held in place very strongly. it would also put stress on the pen clamp which could misalign the pen, or pen tip.